Sean Hannity for President in 2012? Why not, Obama somehow came from nowhere. At least Hannity doesn't lie. I like him, and prefer his views to the brick we have in there now. Idiot NY Governor Says Race is Problem. Yes, the idiot that is currently Governor of New York, David Paterson, has stated his problems stem from his race. He claims Obama is next on the hit list. News flash moron, your problems stem from your idiotic policies. You gained a seat from Americans who overlooked race. But once in office you couldn't help yourself. You are a bumbling fool who is trying to cover up your idiotic policies by pointing fingers. Same will be said for Obama. He will be our biggest failure in America. Americans' again, elected him while ignoring race, but once in office he can not help but actualize the true bumbling fool nature he has. Try looking at the stupid things you say, do and believe. That is the reason your ship is sinking. Carbon Dioxide is Irrelevant in the Climate Debate - Proven. From Rush Limbaugh's Website: Professor Richard Lindzen, MIT, says that "carbon dioxide is irrelevant in the climate debate." Lindzen, nobody disagrees with this man to his face. He has instant credibility, MIT. His work has been peer reviewed. He states, "We now know that the effect of CO2 on temperature is small. We know why it is small. And we know that it is having very little effect on the climate. All of this data leads to the conclusion that the United Nations IPCC models are not only wrong, they're so far off the mark as to be laughable." In other words, the whole bedrock, foundation of manmade global warming, CO2, this MIT professor, says the effect of CO2 on temperature is small and limited. Obama Health Care, More Truth! Take a look at exactly what will happen when Obama care takes over. 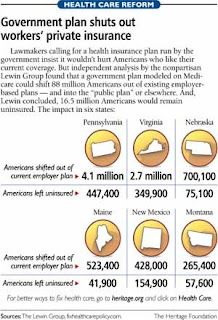 88 million will lose their private health care, and 16.5 million will remain uninsured. Doesn't sound like a fix to me. This analysis has been done by an actual non-partisan independent organization, the Lewin Group. Read this, and watch the guy on the video. America is speaking out, and heaven help the Liberals if they pass this terrible Healthcare Social Power Grab! Especially, listen to the 35 year old female ask the question, "What are you going to do to return this country to what the founders created according to the Constitution"?" What do the Conservatives have to say? We all better listen! Wow! Great question, so what is the answer? We are waiting. I will say it first! Impeach Obama! Maybe it is time to Impeach this radical oppressor of justice and freedom. Read this to see why! Awesome idea, come to think of it, there are no DC powered converters. This smart person has converted their converter to run in portable mode. He shows you how!